This is what Lily, a stay-at-home mom who ran her local Library Association wanted to accomplish. When she began to Google how to do this, she ran into some trouble. Most of what she came across told her to use Wordpress plugins, write code, or hire a freelancer. Unfortunately, she didn’t have the know-how or the budget to do any of those things. Luckily, I happened to meet Lily in an online forum and showed her the easiest way to create a subscription based website all by herself. In just a weekend, she had everything set up. And in just a few days, two new people had registered and paid for her subscription service online. If you’re like Lily and want to set up a subscription website for your organization (but don’t have the expertise or resources to do so), you’ve come to the right place. In this guide I’m going to explain the best and easiest way to do this. What is a Subscription Website? A subscription website is simply an online gate that restricts access to content on your website. Only those who pay can cross through the gate and access your content. make your website responsive for mobile applications. Overall, a good subscription website can save you about 20 hours a week or more in administrative work. That’s because it runs like a machine in the background, processing and updating information while you can focus on other tasks, like creating value for your subscribers. While there are many paths you can take to build your subscription website (you can build a website from scratch, hire a freelancer, integrate subscription-plugins for Wordpress, etc. 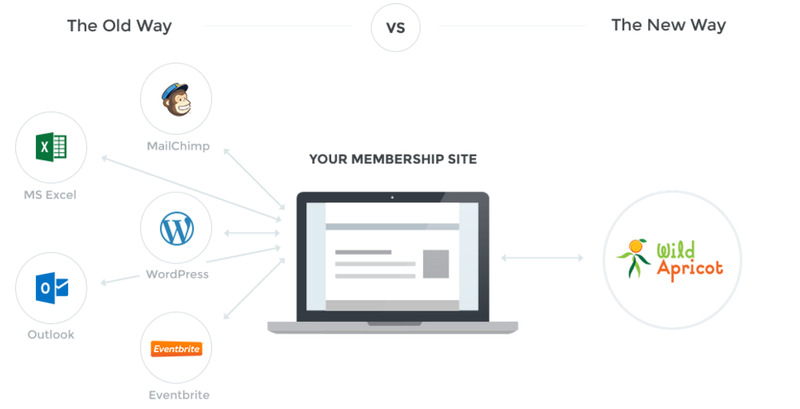 ), my recommendation is to use something called membership management software — an inexpensive (and sometimes free) software that exists to assist those who don’t have any technical expertise, but still want an amazing, robust subscription or membership website. Once you select a membership management software, it can create a pre-populated website for you in minutes. 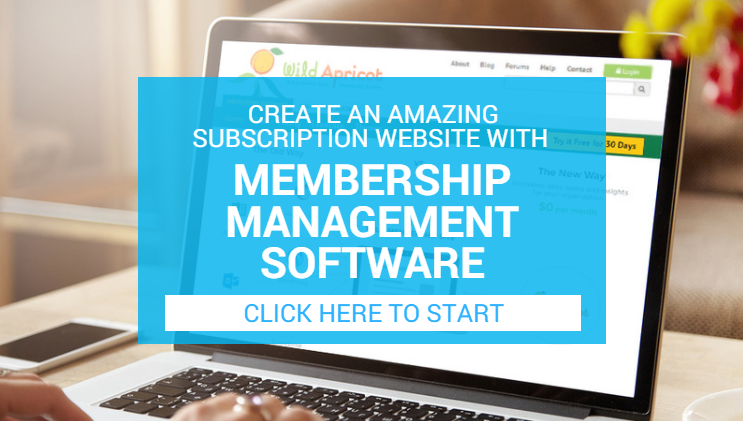 Click here to start a free trial of Wild Apricot’s membership management software. Membership management software is a type of software built to help subscription and membership organizations grow and save time and money when it comes to administrative work. On one hand, it will allow you to create a professionally designed subscription website in a matter of minutes — complete with subscriber-only access pages, a join us page, member directories, and more. The best part is that anyone without any technical expertise can use it, because of its easy-to-use, drag-and-drop tools. In the GIF below, I'm using Wild Apricot's membership management software to drag and drop a membership application onto the subscription website I'm editing. Any other feature you'd like to include such as a member directory, slideshow, or subscription form can be added in the same way. On the other hand, membership management software also automates and eliminates a lot of administrative work, such as processing registrations and payments, designing newsletters, automating reminder emails, and summarizing finances. This means that once your subscription website is up and running, you won't have to do as much work to maintain it and keep your members happy. The #1 membership management software on the market, used by over 20,000 membership organizations is called Wild Apricot (that’s us!). The best part is that you can try it for free. You can start your free, 30-day trial of Wild Apricot here. Wild Apricot also has a free, basic plan which you can use indefinitely. More details on our free plan are here. One of the best things about Wild Apricot is that it's an all-in-one platform. You won't need to set up separate processes like MailChimp for your emails, Excel for your database, or WordPress for your website. If you need help knowing which types of pages to build, which subscription levels to set up, and how to import your contact database, check out this guide on how to set things up in 5 easy steps with no technical expertise. Best of success building your subscription website! Hey Terry, I'd have to agree that Wild Apricot is one of the easier platforms that I've worked with. I've got several customers who use (and love) WA. Some folks do prefer WordPress (the tinkerers) but it's more time consuming than using an all-in-one app.